ABOVE: Sweden: BJH in dense Taiga forest undertaking a recce for a course he's leading training National Geographic photographers in survival skills. They couldn't hack it and disappeared after the second day. ABOVE: Winter en route to Thorsmork in Iceland with our 7.3 litre V8 Ford 4x4 working here with my friend Jón Baldur Þorbjornsson who runs Isafold - the only tour company in Iceland that I/we recommend. ABOVE: BJH in Stakkholtsgja southern Iceland, a deep gorge which channels meltwater down from Eyjafjallajokull. 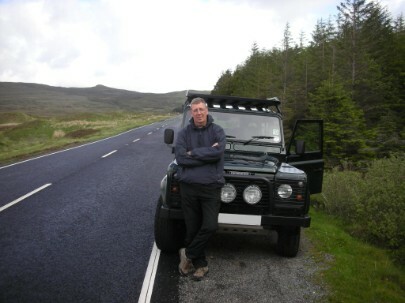 BELOW on Skye, having a well earned break (I drove 3,000 miles in a week) during a contract to assess the feasibility of taking 20 teenagers from a school in Essex to the far North West Highlands for a week's wilderness experience. Conclusion: it isn't feasible: 990 miles of driving to Cape Wrath or Assynt; no rail, no air link. Great place though! Our abiding memory is Assynt - best place in the UK for our mountain work. BELOW: BJH on the infamous 'Dengie 30 miler' - an annual mid January three-day-two-night backpack for youth with behavioural problems. Here, early morning at below -5 deg.C. It's very much a 'sorter' for these youth on what has been one of the coldest weeks of the year. 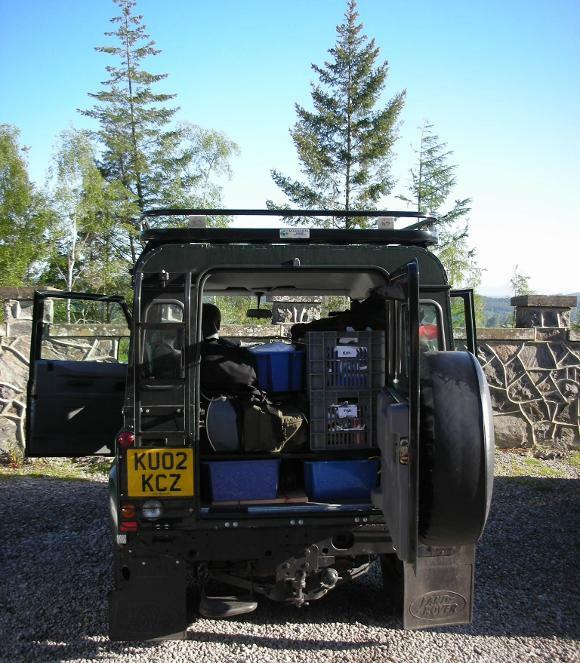 BELOW: 'Hannibal's' modular storage system whilst on a 3,000 mile circuit of the remotest part of the Scottish Highlands assessing the feasibility of educational visits at the top end around Cape Wrath and the Durness/Tongue area. With Mark Beaumont 2010. I am still learning - everyday, and it's great to see young people learning from the outdoors, learning to be outdoors, and wanting to do more and more to understand the elements that make up the natural world - the geology, the meteorology, the bio-eco aspects, the history, and the landscape, and also those who want to be challenged by the mountains, the wilderness, and forests. And have fun. So we're all on this journey together. Essex born and bred, and proud of it, I was educated in Benfleet and Rayleigh, and trained at Eaton Hall College of Education during the 'pre-degree' (ie Cert.Ed) era of training for teachers, I was in the first B.Ed cohort to go through the University of Nottingham School of Education's doors, doing an Hons. Degree, then in 1975 winning a Scholarship from the University to do an MA in Cartography at the Universities of Bucharesti and Cluj in Romania. My research project was on the Atlas nou Românesc ('New Romanian Atlas') the review of which was published by the Royal Geographical Society. (I was already FRGS in 1974 after research on ice core sampling in Greenland). I spent the year in Romania living at the Institutul Agronomique in Bucharesti, working at the Institute of Geography, then studying Mining Education in Baia Mare, Forestry in Cimpulung Molduvenesc, and Special [Needs] Education in Suceava, plus climbing, journeying throughout the country (with the literally ever-present Interior Ministry Police following me everywhere - even up the mountains), and talking to a lot of the monks in the monastries up on the Russian border. I lived in Cluj for 6 months - one of the most atmospheric places that I've called home - a sort of 'Cambridge in the mountains'. In 1974 I spent the summer with a USAF expedition, as an international member (geomorphologist/glaciologist) of one of the last dog-sledge expeditions in polar history to cross the Greenland ice-cap, working with the Danish 'Slædepatruljen Sirius'. It was a life-changer to be there with these guys, and I think that my philosophy of life was moulded by their selfless professionalism and sheer hard work, and perhaps along with working with UK Special Forces, these two groups alone have been responsible for providing a template for what is now my long outdoor career. From graduation I taught for a short while in a Prep School just down the road from the College. I was offered a job, with a house, running the Geography Dept (where the Dept. resources amounted to a box of chalk and one set of OS maps) but seeing that it was a bit of an ivory tower - albeit a beautiful one - I decided to stick with the State system. I'd spent each and every long holiday working (both whilst training and in my first four years teaching) for the MOD as a CI, first as a Navigation Instructor, then Survival Instructor, with 971 Training Team based in a small barracks in the Leominster area. I travelled thousands of miles in the next eight years instructing all three armed services in Hereford, Hitchin, Aldershot, Arbroath, across Devon, and dozens more, both on-base and on-Exercise as far afield as northern Norway. We also had a remedial training facility for injured troops to rehabilitate skills and those who just couldn't hack it due to psychological pressures. I was a member of, or led, about 40 expeditions during this time mainly to the Arctic and northern Scandinavia. I worked in secondary education for 31 years which included running a large Geography Dept. 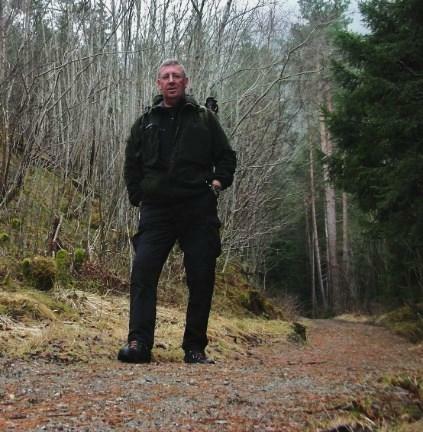 in a school of 1800, teaching all the Humanities subjects, plus PE and Sociology, and in 1991 convincing the then Headteacher to allow me to step aside from being Head of Geography, start up an Outdoor Education programme, keeping me on the same salary, but with a remit to get off-site as much as possible and run remote area expeditions; I'd need my own separate classroom with changing facilities for pupils, a team of staff to train, secure storage, latitude to be out of school one day in every three or four, and a budget of about £20,000. Surprisingly he said 'No'. Can't think why. After much writing of study/research papers, in 1991 he was brave enough to say 'Yes'. We became the foremost school in the country running outdoor education on-timetable for every one of our 1800 pupils, once a week. We had 40+ acres of woodland right next to the school. Our remote area school 'visits' took us to Norway in Spring and winter (still the only school in Essex to run its own winter international mountaineering courses for pupils) and Iceland in Spring and Winter. Our D of E programme was amazing. We won a lot of awards. This became a launch pad for many projects and expeditions. A few years earlier with some friends I'd set up 'Hunter Outdoor Education Services' to aid the staffing of school trips with experienced and increasingly well-qualified staff who'd 'been there-done it'. It worked a dream and we were widely in demand. We re-wrote the book on school visit safety, and gave a number of lectures and talks nationwide linked to our philosophy. Those were heady days where we trained like stink and crossed every 'T' and dotted every 'i' until you'd find 'Safety with Managed Risk' running through each of us like a stick of rock; about seven or eight of us became extremely specialised in leading expeds, and active outdoor education courses. We were way ahead of the game - ahead of our time by decades. The BBC has used me on 20 occasions as an Expert Witness during the aftermath of school visit tragedies to comment on safety. Sometimes I've had to do this via a sat-phone link whilst in the Arctic during my research expeditions.' Hunter Outdoor Educations Services' formally became 'Hunter Outdoor Training' in August 2006. As part of Ph.D preparation I have researched every major (and quite a few minor) school visit accidents related to UK schools, since 1970. It makes for sobering reading and thought. I left formal teaching in 2006, in that year being awarded 'Chartered Geographer' status by the Royal Geographical Society. Qualifications by this time included ML(Summer) and a Winter ML (Training), SPA, and a raft of advanced expedition-medic qualifications. I still held my MOD Service No. and spent infrequent 'ad hoc' weeks and week-ends supervising and marshalling/umpiring Exercises where there was a survival component; that included RAF Rotary-Wing Cross Training to Sea Kings. I set up and instructed the 'Basic Expedition Training Award' for all interested parties in the area - including Hunter Instructors and school staff. This has now morphed through 'BELA' to the 'Award in Basic Expedition Leadership'. It's pretty much all the same. On the second course I was visited by the National Director who gave me an uncommon grilling - asking scores of questions about what we do in Hunter and in the school. Two things emanated from that evening: one, I was asked to be a Regional Moderator for the Award, and second I was proposed to Ofsted as a 'National Example of Good Practice in Outdoor Education'. We were on a roll, and ran a great number of BETA/BELA courses. Through travelling across the length and breadth of East Anglia and east London I could uniquely gauge the place and health of the teaching and instructing of outdoor education - a healthy activity in every sense of the word. I was made the UK's first 'Outdoor Education Champion' for determined and productive delivery in the field of Outdoor Education', by the NAOE, having created a ground breaking innovative method of managing pupils' learning when experiencing conceptual difficulties; that project was cascaded to about 80 schools. In 2002 I won a Fellowship from the Winston Churchill Memorial Trust to allow me to research school and youth expedition safety across the whole of mainland Scandinavia, and in that year drove, solo, over three consecutive months,10,000kms north to the Arctic Russian border with Norway and the North Cape, and all the way back south into Sweden and southern Norway, visiting schools, government offices, private outdoor pursuits providers, and rescue teams in my quest to find good practice in outdoor safety for young people. My findings (which were interesting), went not only back to the Churchill Trust but also to the Prime Minister's Office who had requested a copy of my report. Later that year all schools in the UK were duty bound to have in place an Educational Visits Co-ordinator to manage pre-visit organisation and safety. Job done. Today I am working with over 150 client-organisations: schools, businesses, and uniformed youth groups, lecturing on the psychology of survival, plus managing the unique Asheldham Centre, and advising Headteachers, Governors and Councils. 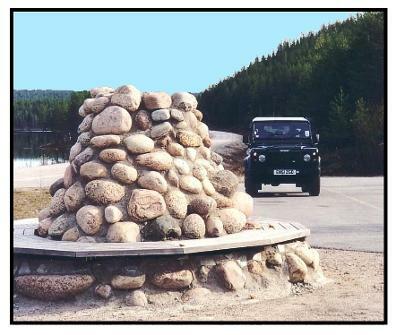 Above: The 2002, three-month, solo, 10,000 kms Churchill Trust expedition, overlanding across the whole of Scandinavia. Here 'Winston' at Jokkmokk at the Arctic Circle coming south.